$130 million for only 45 miles of pipeline? Really? And why should any millions of dollars trump drinking water and clean watersheds? 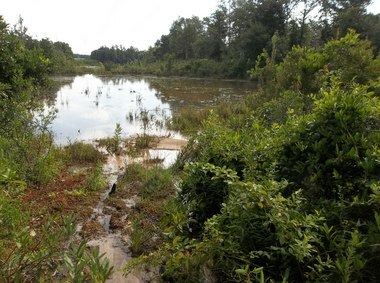 Last month, the Southern Environmental Law Center filed the suit, acting on behalf of Mobile Baykeeper and alleging violations of the Clean Water Act and the Corps’ failure to follow proper procedure in permitting the pipeline. Who is Plains Southcap, anyway? An Alabama LLC filed on behalf of a Houston address. Oh, wait, it changed to an Inc. But it’s still at that same Houston address, 333 Clay Street Ste 1600 Houston, TX 77002, where 23 companies are filed in various states. Most famous former occupant of Three Allen Center was spectacularly-failed energy company Enron. So who at Three Allen Center in Houston filed that LLC and Inc. for Plains Southcap in Alabama? Apparently Plains All-American Pipeline, according to Alabama PSC Docket No. 31734 Application for Certificate of Industrial Development Testimony and Proceedings 20 November 2011. That testimony seems to be about this same pipeline to a Chevron refinery in Pascagoula. Plains is using the same kind of shell company game as Spectra is with Sabal Trail Transmission LLC and Sabal Trail Management LLC. What stops any of these LLC shell companies from going bankrupt and vanishing if there’s an explosion or a leak like the chemical spill in West Virginia that poisoned drinking water for 300,000 people after which “Freedom Industries” went belly-up?